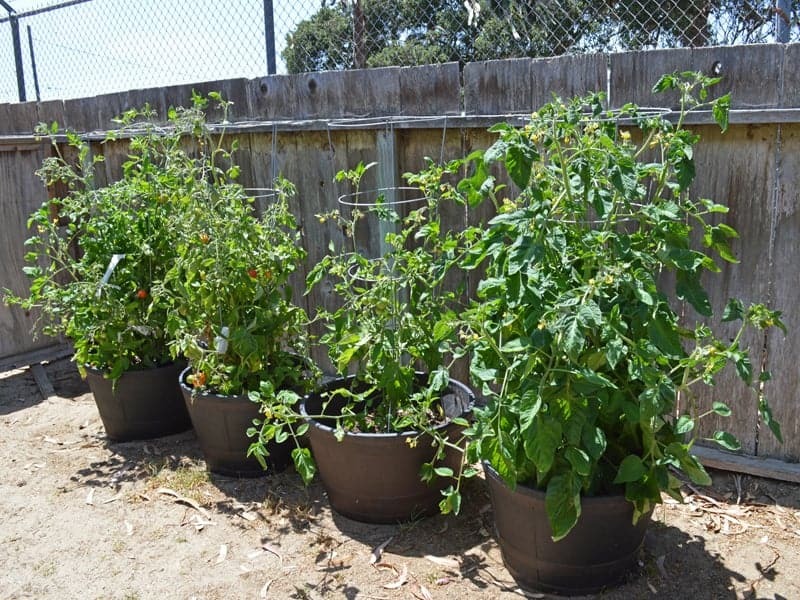 Growing vegetables in pots for beginners: Choosing the right containers for your urban garden can make your limited space productive. Here’s the lowdown on vegetable container gardening from Tiffany at Don’t Waste the Crumbs. Sometimes it feels like my home doesn’t want me to have a garden. We rent a townhouse (so no permanent structures) in California (with severe drought) and have a backyard comprised of sand (i.e. no soil). 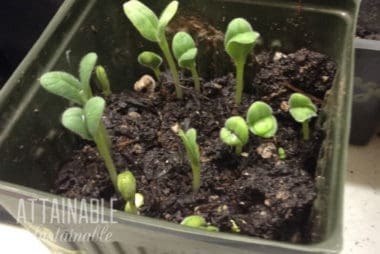 We solved the last two issues by re-using house water for the garden and employing dozens of ways to naturally fertilize store-bought dirt for free. Growing a vegetable garden in a rented, urban setting though, requires a bit of resourcefulness. How can we have a bountiful garden to off-set our small grocery budget when we can’t even dig up the yard? Enter garden containers! A container garden was the first thought to come to mind, but we felt limited to a small handful of plants that grow well in containers. Fortunately, we were wrong! With a bit of creativity, you can have a flourishing garden in all sorts of containers. 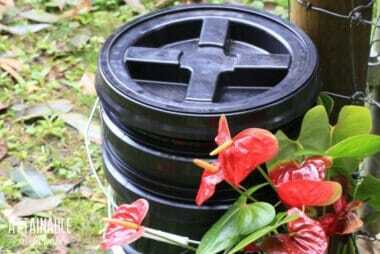 The key to growing vegetables in containers is knowing which containers are best for which plants. This is what most people think of when they think of vegetable container gardening. These large planters are best for single vegetables that need a lot of root space, cages, or a trellis. 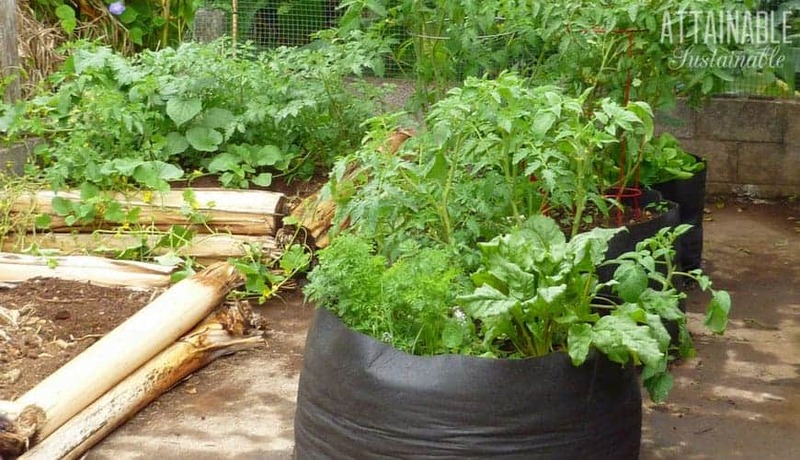 Tip: Kris has had great success with large grow bags for her vegetable container gardening. A bit less cumbersome than big containers, medium-sized pots and are perfect for compact vegetables or those of the bush variety. When you can’t plant at ground level, consider planting above! 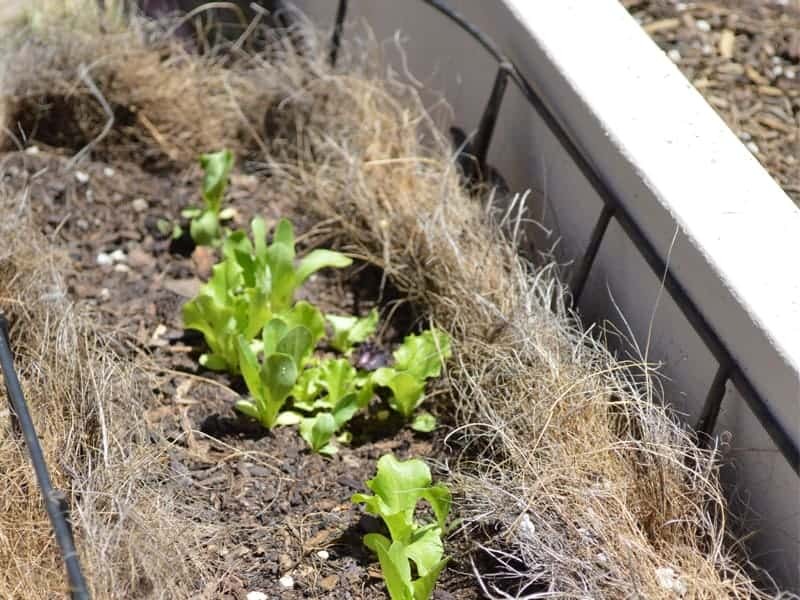 Some plants actually do better when they’re not lying on the ground and with vertical gardening you can utilize the space, freeing up the ground surface for plants that need it. 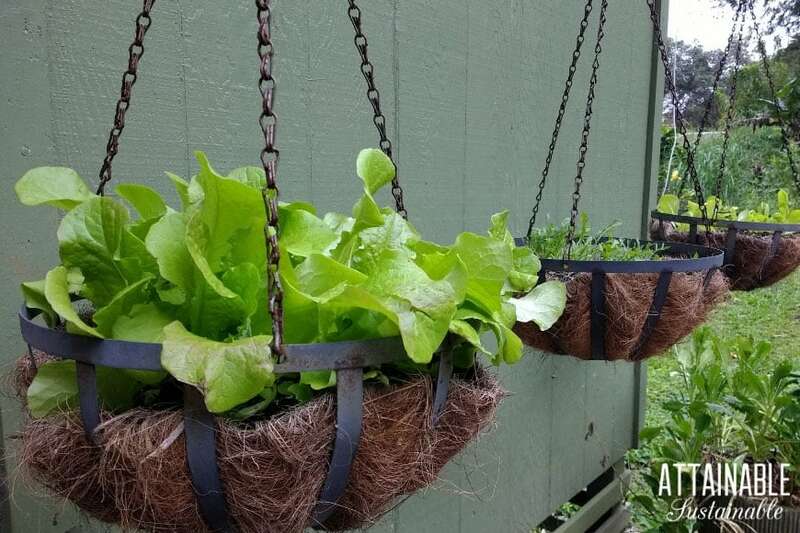 A hanging vegetable container garden helps combat pests, too. Tip: Hanging doesn’t have to mean high. Use longer ropes so the plants are within reach. Despite the name, window boxes don’t have to sit just by a window and they can hold more than just flowers. 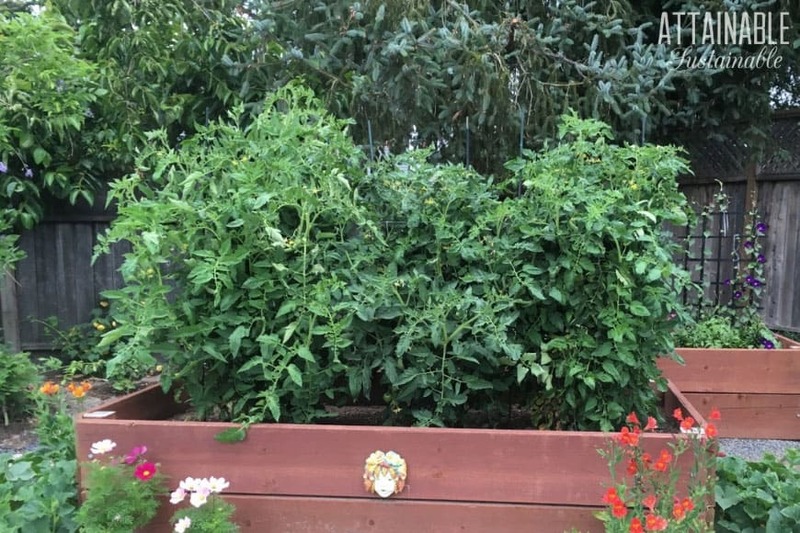 Some boxes fit over railings or can be hung on the side of a fence, turning those lost areas into a little container garden to grow vegetables. Plants that tend to keep to themselves, don’t need much root space, and/or grow up are best for window boxes. 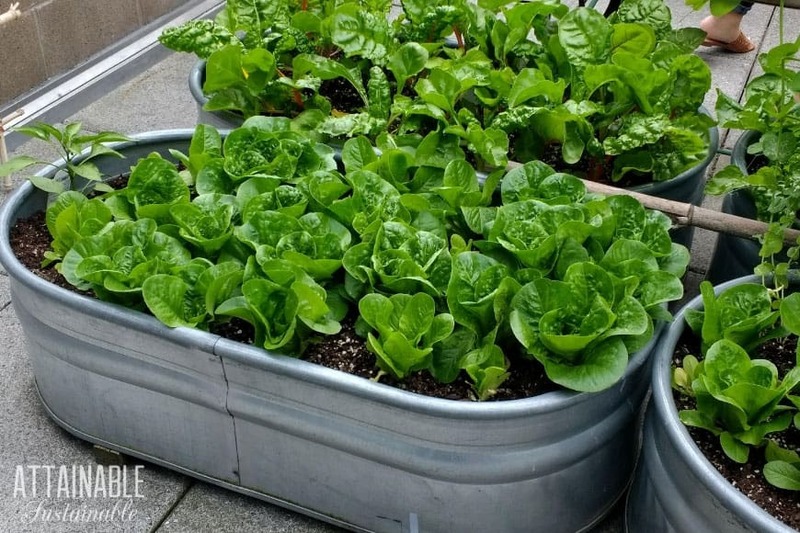 The biggest “container” of the bunch, raised garden beds are an easy way to work around the limitation that are problematic for many renters: no-permanent structures. You can build a raised bed for under $15 and it’s perfect for plants that like to roam. 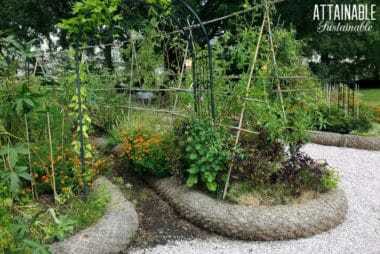 Tip: Maximize the space within your garden bed with urban square foot gardening. Err on the large side; the bigger the pot the better. More pot means a better yield. Be sure your container has a drainage hole – especially important if you’re recycling containers that might not already have a drainage hole. Instead of wondering what to plant in your container, start with what you want to grow and find a container that works. Ask friends what works for them – you can learn a lot from their experience! It might take a bit of creativity to grow a container garden, but with a little bit of planning you can still have an amazing harvest! Tiffany is passionate about feeding her family real food and living healthier lives, without going broke in the process! 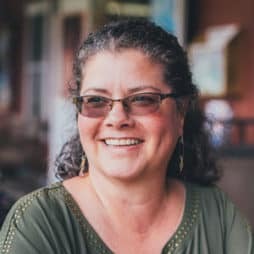 She shares her enthusiasm for affording real food on a budget, and documents her baby-sized strides at Don’t Waste the Crumbs. Even if you have a lot of garden space, container gardening is something to consider. Containers are really easy to keep weed free. You do need to make sure they don’t dry out in summer heat. When you are overwhelmed by the weeding required in a big garden, a few containers of easy to harvest greens or herbs might just be the ticket to keep your enthusiasm up for the long season. I’m very grateful for having stumbled upon this site. We live in one of those Joburg town complexes where yards are quite small. A few years ago I boldly started planting veggies in front of my kitchen. The yield of potatoes, tomatoes, spinach, lettuce and carrots was amazing. I created more space by sacrificing two trees that were hugging the wall and not serving any purpose as the rest of our garden is bushy enough. We tried sweet potatoes and, as inexperienced as I am, it never occurred to me that I’d be faced with a widely crawling plant like that. I panicked and decided to discontinue the sweet potatoes but the harvest left me speechless. Such huge produce! I then planted squash on the same area not knowing that it also crawls. We harvested in December and it was with such pride that we had veggies from our own little garden on our Xmas dinner table. This thing continued to grow and crawl as we continued to get summer rains. Unbeknown to me, it was no longer the squash that was fiercely growing but the sweet potato. My helper who knows a lot about gardening explained to me that the sweet potato never really goes away. So with the rains and richness of the soil it just came back to life. I don’t have enough space to allow that crawling so i’m going to have to seek advice on how to stop it altogether. As for the pots, i’ve hoarded these plants for years standing empty in my yard against the wall not really knowing what to plant in them. Thanks to this article, I now know what to plant in them. I love gardening. Hi Tiffany! You can plant tomatoes in a hanging container as well! love your tips! Please check out Larry Hall on FaceBook and Youtube for watering ideas in Ca. I live in Martinez, CA and will be using his watering system next year. Is there a printable link to this article? I’m having trouble with that function. Hopefully it will be restored soon!